Sad News- It looks like we've go no choice but to say goodbye to a friend. 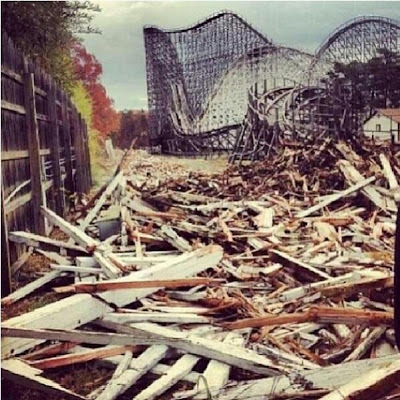 The image to the left is from Six Flags Great Adventure, the beloved roller coaster "Rolling Thunder' now seems to be pile of wooden rubble waiting to be removed. Nicknamed "Rotting Lumber" by fans, the park neglected this coaster for years in hopes of finally making it disappear. It seems as of last week, this is a reality. Lumber litters the ground to make way for 'progress'. That progress is called 'Zumanjaro'.. the new drop tower getting attached to the back side of Kingda Ka. Which raises the question- Do we really need ANOTHER drop tower ride? Many of us reached out to Six Flags asking them not to remove this attraction- trust me, they've got the land to build fresh but it seems our pleading once again fell upon deaf ears. Some days I really, really hate "progress".